Geology in the West Country: Did Global Glaciation Cause the Great Unconformity? This Article follows on from the the postulation of Snowball (or Slushball) Earth, to speculate about the consequences of having so much ice - erosion on a grand scale. 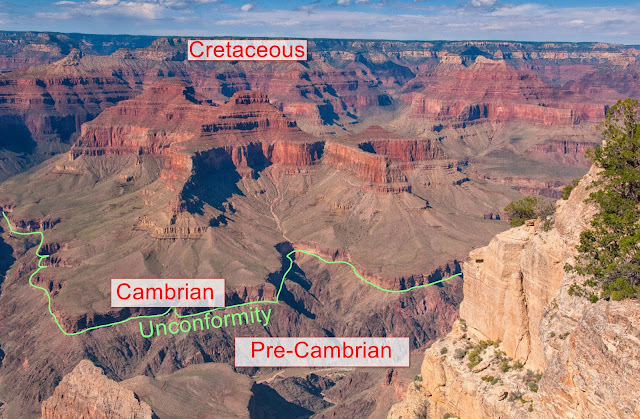 At the end of the Proterozoic there are unconformities in many parts of the world. In North America one can see this unconformity in the Grand Canyon, where it is known as the Great Unconformity. My photo of the Grand Canyon showing unconformity between the Pre-Cambrian (here Vishnu Schist) and the overlying sediments. The authors estimate that 1.6 km was eroded from all the Earths land masses on average. Eventually this material will be subducted and therefore disappear - except for zircons! To decide whether zircons came from the crust or the mantle the authors look at two isotopes of hafnium. And decide that at the start of the Neo-Proterozoic the proportion of crustal origin zircons increased.